Is there anything better than a slow morning that includes a leisurely breakfast? Sitting there, across from someone you love. Crunching on bacon. Sipping orange juice. Lingering over coffee and a crispy warm doughnut. D often works on Saturday mornings, and I work during the week, so it’s been quite a while since a leisurely breakfast has been an option. 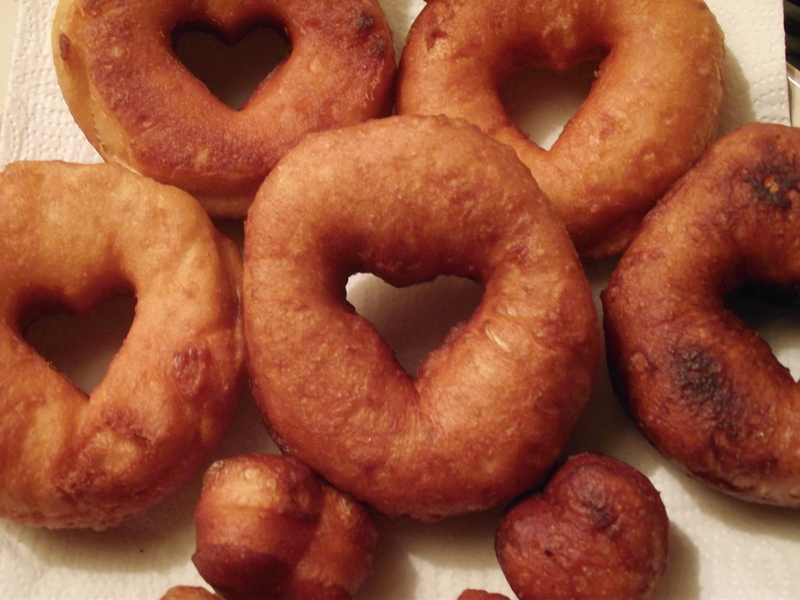 When it is, though I still don’t want to wake up too early, which is why discovering this Doughnut recipe plastered all over the internet was so exciting. Are they the best doughnuts I’ve ever eaten? Nope, but I do like them better than the ones I can get at the grocery store. If you were hoping for something healthy, go away. These are not for you. But, if you were hoping for something warm, crispy, sweet, and delicious; something that will compliment your coffee while you enjoy the coming spring mornings on your balcony, continue reading. All you need is a tube of refrigerated biscuits and some veggie oil. While you’re heating up the oil (about 1/2 an inch in a med-large sized skillet) on medium heat, use a small cookie cutter to remove the centers of the biscuits. I only had a heart shaped one, but you could probably just use a knife to cut out the center. Also, get a plate ready with a few layers of paper towel on it– that way you’ll have somewhere to put the doughnuts once they are fried. 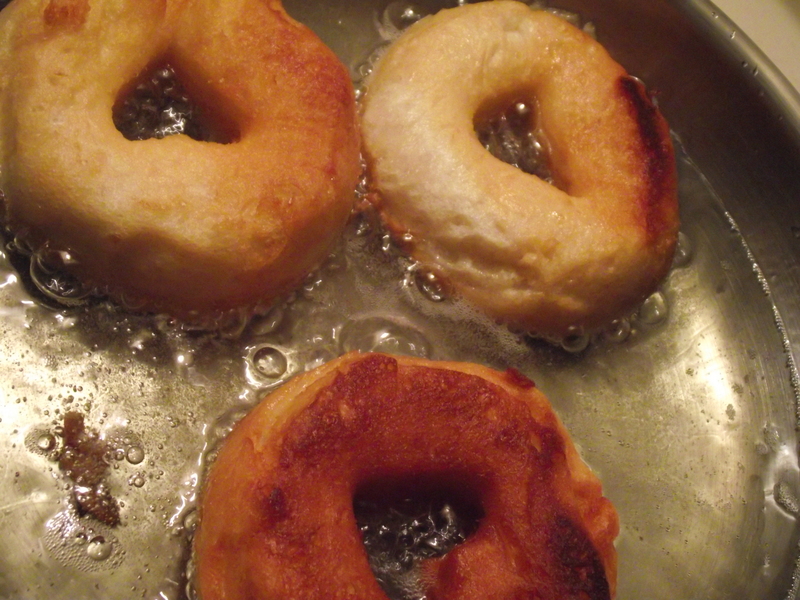 Then, once the oil’s had a little time to heat up, carefully place the doughnuts into the oil. Yummmmmm. I love that sound. It only takes about a minute or two, then you’ll need to flip them over. Since I’m a little shy of extremely hot oil (due to an unfortunate experience in Brazil which I somehow escaped without a scar), I used our long handled grilling tongs, and they were perfect for the job. You can do a few at a time. 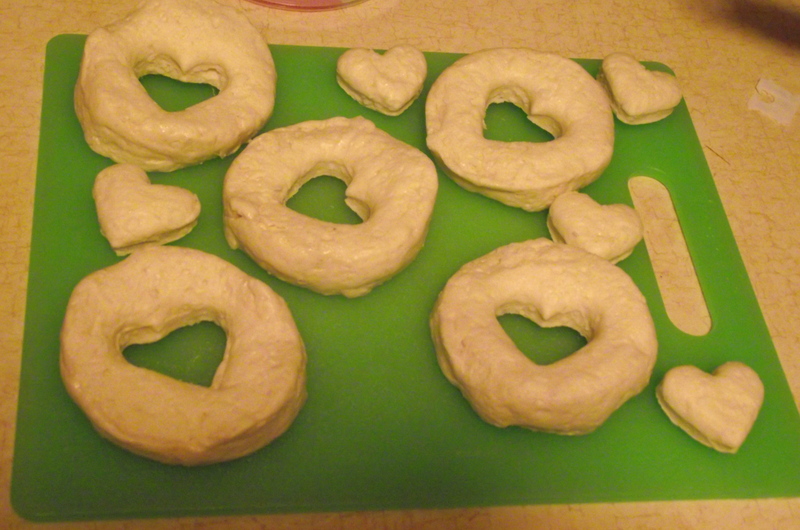 I also threw in the centers to make little bite size doughnut treats. Look at them! Don’t they look amazing? Excuse me. I need to get something to clean the drool off my keyboard. Come to me, Doughnuts! While those babies are cooling off, go ahead and prepare a few toppings. I did cinnamon sugar on a few and chocolate frosting on the others. 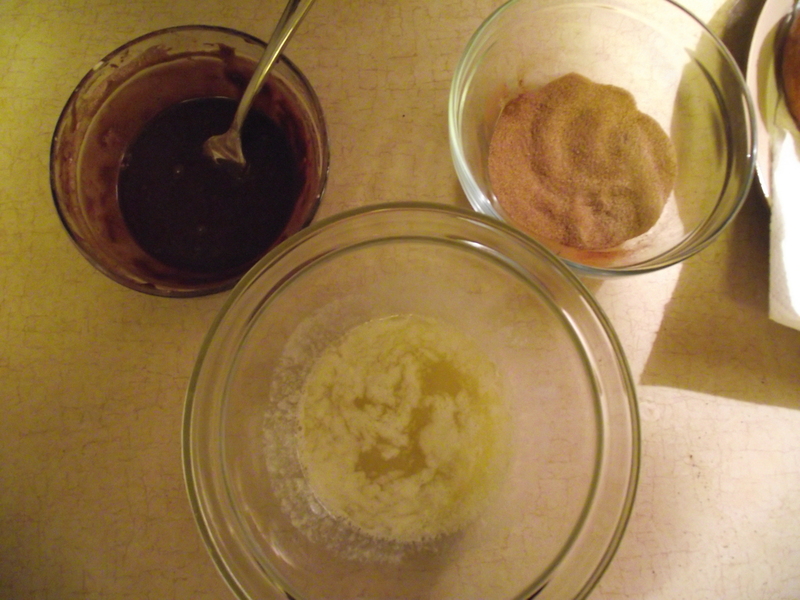 For cinnamon sugar: dip the doughnut in melted butter, then coat with a mixture of cinnamon and sugar. I think I used something like a half stick of butter for 6 doughnuts. Healthy. 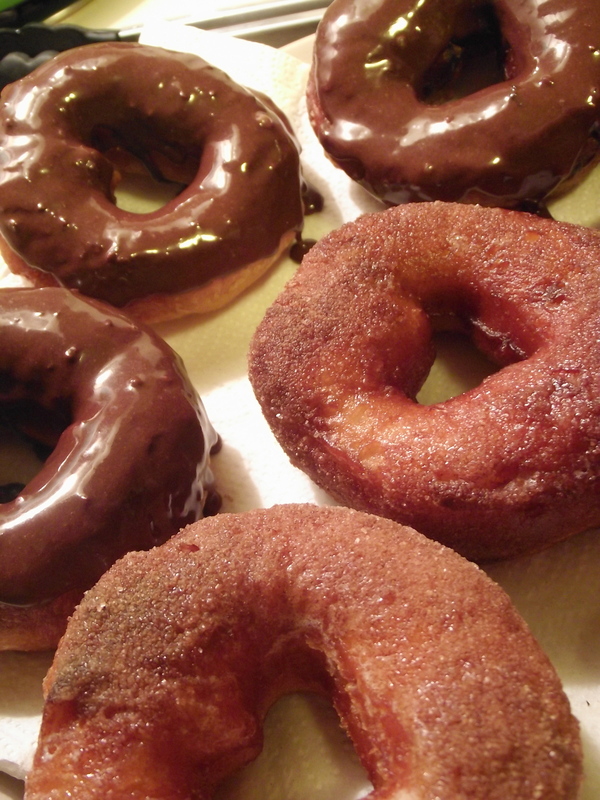 For the chocolate, I found it easiest to dip the doughnut right in the frosting, rather than trying to spread it. Look at these delicious little guys. Aren’t they so cute? They are an excellent addition to any leisurely Saturday breakfast. I made two batches within a few days and decided that it is no longer safe for me to keep refrigerated biscuits in the house. If any of you try it, let me know what kinds of toppings you use! Love it! Would like to try it, but I am not a very good cook. Oh yeah. THEY ARE VERY CUTE!!!!!!!!!!!!!!!!!!!!!! !